Crichton Foundation > Roots, Heritage and Identity: a human need in a crazy and turbulent world. Roots, Heritage and Identity: a human need in a crazy and turbulent world. Our speaker this evening is Kate Mavor, the Chief Executive of the National Trust for Scotland (NTS) based in Edinburgh. The NTS is Scotland’s biggest membership organization set up in 1931 for the preservation of natural and human heritage that is significant to Scotland and the world. Our speaker this evening is Kate Mavor, the Chief Executive of the National Trust for Scotland (NTS) based in Edinburgh. The NTS is Scotland’s biggest membership organization set up in 1931 for the preservation of natural and human heritage that is significant to Scotland and the world. Subject to occasional controversy, the Trust has a never ending struggle to fund conservation work. Responsible for buildings, coastlines, islands, 190,000 acres of countryside, 35 major gardens, battlefields and 10,000 archaeological sites and much more besides, Kate has a challenging role to play in managing such a vast portfolio. She studied at Oxford University and the London Business School and has worked in a number of management roles in book publishing and language school businesses. She set up her own market research company in the 1990s to promote links with the newly emerging Polish market. On her return to Scotland in 2005 she became Chief Executive of Project Scotland the pioneering youth volunteering programme. 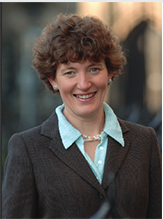 She was appointed NTS Chief Executive in 2009. Originally from Glasgow she now lives in Edinburgh with her husband and two sons.